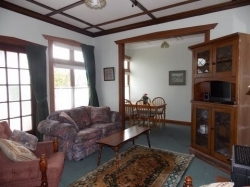 This BnB, Homestay and Self Catered Accommodation @ Te Maunga (meaning mount or high place) is registered Heritage , remaining in its former character with modern facilities. 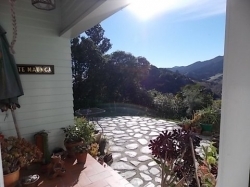 Built in 1936 this stunning native woods Arts and Crafts style home, is still family owned . 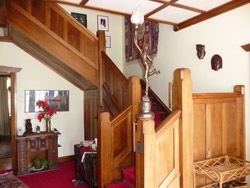 Te Maunga's history is displayed in its library.The Bed & Breakfast , a Studio with basic facilities , plus a 2 Bdrm - 2Bath Contained Apartment sit on a knoll within a rambling garden giving commanding views over city, sea and valleys. A Posh Camping garden treehouse attracts the younger traveller. Te Maunga is only five minutes by car or a pleasant fifteen minutes walk to downtown Nelsons cafes,restaurants, & information services. Walk to downtown, riverside picnic & swim areas plus a family safe Beach is accessed within minutes. A Bicycle trail leading to other links - starts at the door . Enjoy your special continental breakfast, by arrangement or maybe a glass of local wine in the garden, whilst listening to native birdsong and taking in the wonderful views - you won't be disappointed!